The oceans cover more than 70 percent of the earth's surface, yet their depths remain largely unknown. 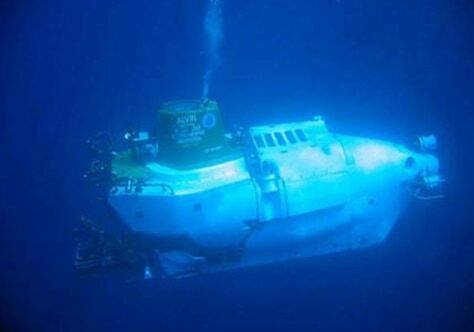 It's a frontier that scientists are racing to explore using tools such as the deep-ocean submersible Alvin, shown here. Click the "Next" arrow above to learn about 10 deep-ocean secrets that have come to light. 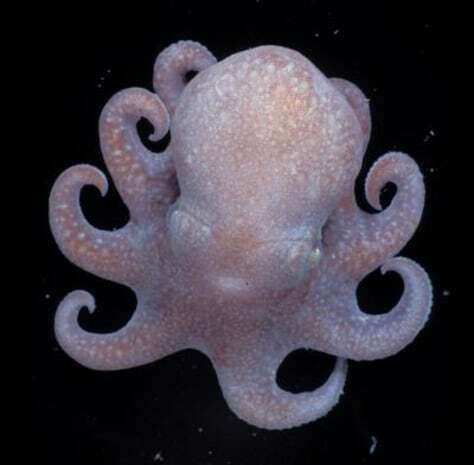 Many deep ocean octopuses trace their origins back to relatives that swam in the waters around Antarctica. The migration began about 30 million years ago when the continent cooled and large ice sheets grew, forcing octopuses there into ever deeper waters. The climate shift also created a northbound flow of deep, cold water that carried the cephalopods to new habitats. As they adapted to new niches, new species evolved. Many lost their defensive ink sacs because the pitch-black ocean depths required no camouflage screen. The species known as Megaleledon setebos, shown here, is the closest living relative of the deep-sea octopuses' common ancestor. The orange and red starfish relatives called brittlestars have managed to defy the odds and colonize the flanks of a giant, underwater peak on the Macquarie Ridge, an 870-mile-long underwater mountain range that stretches south from New Zealand to just short of the Antarctic Circle. The peak, known as a seamount, juts up into a swirling circumpolar current that flows by at 2.5 miles per hour, delivering ample food for the brittlestars to grab while sweeping away fish and other would-be predators. 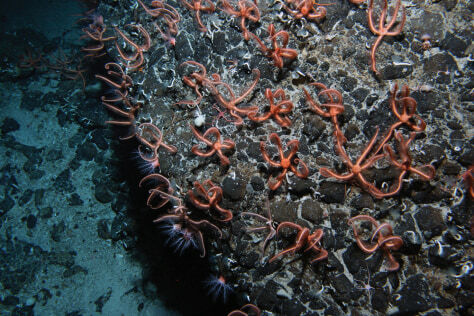 Another brittlestar species has settled on the seamount's flat summit, a habitat normally settled by corals and sponges. 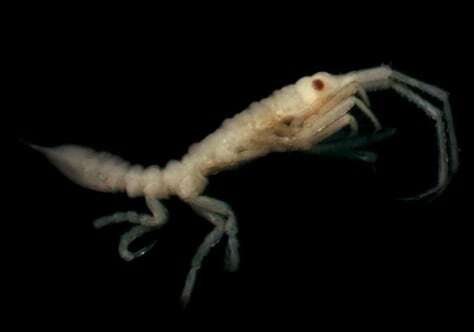 This pale crustacean from the genus Cylindrarcturus is one of more than 700 species new to science found scurrying, scampering and swimming in the frigid waters between 2,000 and 21,000 feet below the surface of the Weddell Sea off Antarctica. The discoveries were part of a research project to determine how species at different depths are related to each other there, and to other creatures around the world. "The Antarctic deep sea is potentially the cradle of life of the global marine species," team leader Angelika Brandt, an expert from the Zoological Institute and Zoological Museum at the University of Hamburg, said in a statement announcing the discoveries. Scientists working deep inside the Arctic Circle have discovered a cluster of five hydrothermal vents, also known as black smokers, which spew out liquid as hot as 570 degrees Fahrenheit. The vents are 120 miles further north than the closest known vents, which tend to occur where the seafloor spreads apart at a quicker pace. 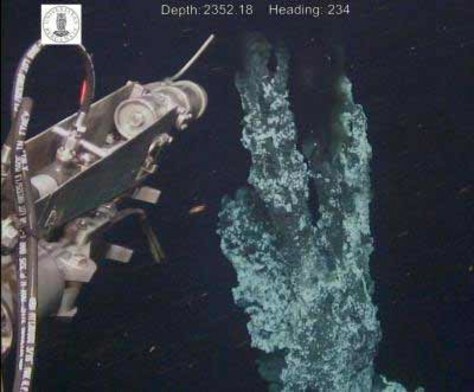 This image shows the arm of a remotely operated vehicle reaching out to sample fluids billowing from the top three feet of the tallest vent, which reaches four stories off the seafloor. The chimney is covered with white bacteria that feast on the freshly delivered minerals. 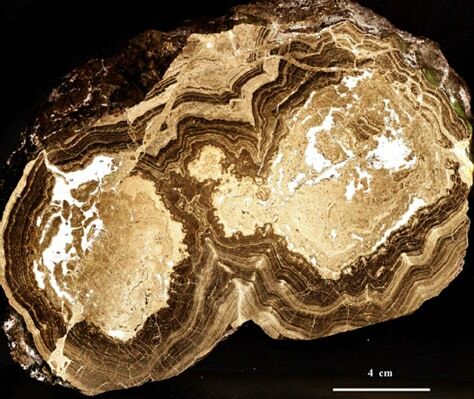 The discovery of primitive bacteria on 1.43 billion-year-old black-smoker fossils – a crosscut is shown here – unearthed from a Chinese mine adds weight to the idea that life may have originated in deep-sea hydrothermal vents, according to geologist Timothy Kusky at Saint Louis University. The ancient microbe dined on metal sulfide that lined the fringes of the chimneys. The oldest-known life forms on Earth are 3.5 billion-year-old clumps of bacteria found in Western Australia. That find suggested that shallow seas, not the deep oceans, were the birthplace of life. Neither discovery, however, serves as the definitive answer about life's origins. Once thought barren and sparsely populated, the deep-ocean floor is home to rich and diverse communities of bacteria. In fact, scientists have found that the seafloor contains three to four times more bacteria than the waters above, raising the question of how the organisms survive. Lab analyses suggest that chemical reactions with the rocks themselves provide the fuel for life. The discovery is another tantalizing hint that life could have originated in the ocean depths. In a statement about the find, the University of Southern California's Katrina Edwards said: "I hope that people turn their heads and notice: There's life down there." Where do deep-sea fish go to spawn? Life in the dark, cold and vast depths of the sea was long thought to be lonely for the few fish that dared eke out an existence there, mostly from organic detritus that sinks from shallower waters. 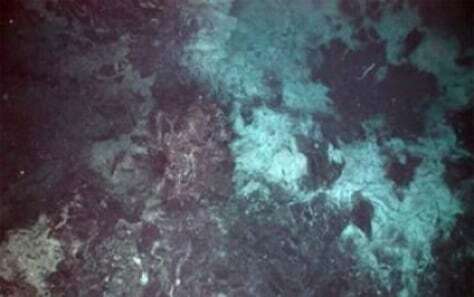 That picture began to change in 2006, when researchers probing the Mid-Atlantic Ridge discovered that fishes may occasionally gather at features such as seamounts to spawn. The evidence for these gatherings comes from the sheer volume of fish collected at seamounts – much higher than would have been expected if the fish were purely nomadic wanderers. What's more, images made from acoustical "scatterings" are suggestive of a massive fish aggregation. 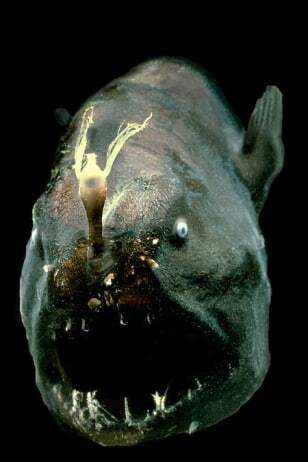 The 35-pound anglerfish shown here is one of the rare species hauled up from the deep during the project. What did you expect? Would a colossal squid have anything but eyes big enough to generate a few over-the-top superlatives? Probably not - but still, when researchers thawed out this squid in New Zealand, the wow factor was undeniable. The creature's eye measured about 11 inches across; its lens was the size of an orange. Scientists suspect the big eye allows the huge squid to capture a lot of light in the dark depths in which it hunts. 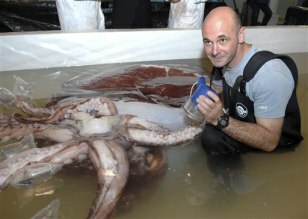 The squid weighed about 1,000 pounds when caught in the Antarctic's Ross Sea and measured 26 feet long. Scientists believe the species, which can descend to 6,500 feet, may grow as long as 46 feet. Some coral reefs are found thousands of feet below the ocean surface, where they have grown amid frigid waters for millennia. Like tree rings, they serve as a faithful archive of global environmental change, according to Robert Dunbar, a professor of geological and environmental sciences at Stanford University. His team travels the world to collect samples of these corals, such as this one from a colony near Easter Island. In 2007, the team published a 300-year archive of soil erosion in Kenya, as recorded by coral samples collected from the bottom of the Indian Ocean. 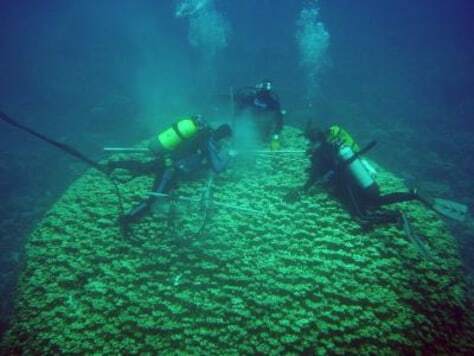 They are now analyzing 4,000-year-old corals discovered off Hawaii to create an archive of climate change. Some scientists are working urgently to expose more secrets of the deep ocean before unexplored treasures are plundered. Their biggest concern is the fishing practice known as bottom trawling. 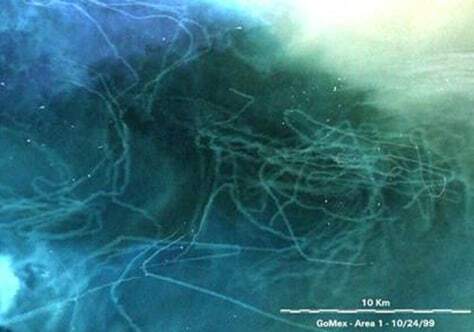 This image shows the billowing plumes of sediment left in the wake of trawlers dragging giant nets across the ocean floor in the Gulf of Mexico. The practice has been shown to strip coral reefs bare and ravage underwater ecosystems such as seamounts, where thousands of species are known to gather. Though the practice is increasingly restricted, tens of thousands of trawlers continue to ply the deep oceans.